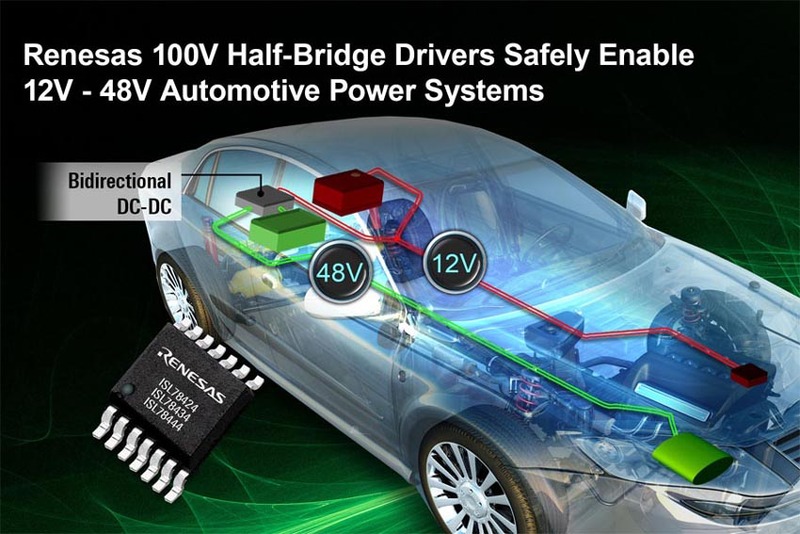 Renesas Electronics announced a new family of automotive-grade 100 V, 4 A half-bridge N-channel MOSFET drivers. The ISL784x4 family features three devices: the ISL78424 and ISL78444 with single tri-level PWM input for controlling both gate drivers, and the ISL78434, which has dual independent inputs that separately control the high-side and low-side drivers. The ISL784x4 half-bridge N-MOSFET drivers complement the ISL78224 4-phase bidirectional controller, enabling it to provide up to 3 kW of power and greater than 95 percent efficiency in 12 V-48 V converters used in mild hybrid vehicles. The ISL784x4 drivers are also well suited for 12V-24V bidirectional DC/DC converters, as well as other high current buck or boost applications. The ISL784x4 drivers are a great fit in high current DC/DC applications like the 12-48 V converter for 48 V mild hybrids. They improve efficiency by delivering robust gate drive with 3 A peak sourcing current and 4 A peak sinking current. Strong gate drive allows them to rapidly switch high current MOSFETs with large gate capacitance, which reduces switching losses. The half-bridge MOSFET drivers’ adaptive dead time control minimizes excess dead time to reduce conduction losses and further increase DC/DC conversion efficiency. In addition, the ISL784x4 drivers offer voltage ratings that are ideal for 48 V automotive systems with the switching node tolerating 70 V DC and up to 86 V for infrequent transients. Similarly, the high-side driver’s bootstrap node can tolerate 86 V DC and up to 100 V during transients. The ISL78424 and ISL78444 using tri-level PWM signals can be combined with the ISL78224 4-phase bidirectional, synchronous PWM controller to perform power conversion between 12 V and 48 V buses in 48 V mild hybrid vehicles. Designers can add a Renesas RH850 microcontroller to provide ASIL safety monitoring, system control and vehicle communication. The ISL78424 and ISL78444 can also be combined with the ISL78225 4-phase controller or ISL78220 6-phase controller to create an automotive audio amplifier power supply. All three half-bridge drivers – ISL78424, ISL78434, and ISL78444 – and evaluation boards are available now. Each device comes in a 14-lead HTSSOP package priced at $1.70 USD in 1k quantities.